We’ve reached a point in this hobby where certain names evoke excitement on their own, without knowing a thing about what they are working on. 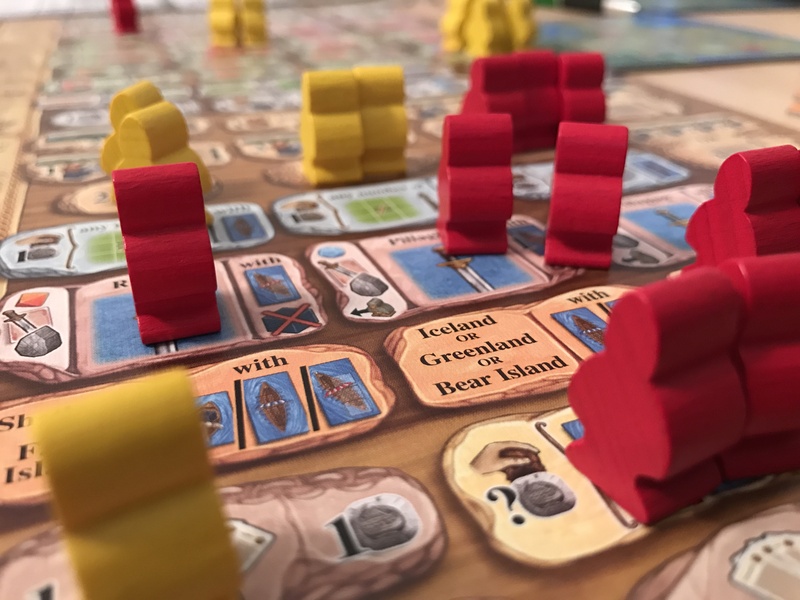 Uwe Rosenberg is one of those designers and his newest game, A Feast for Odin, shows exactly why. 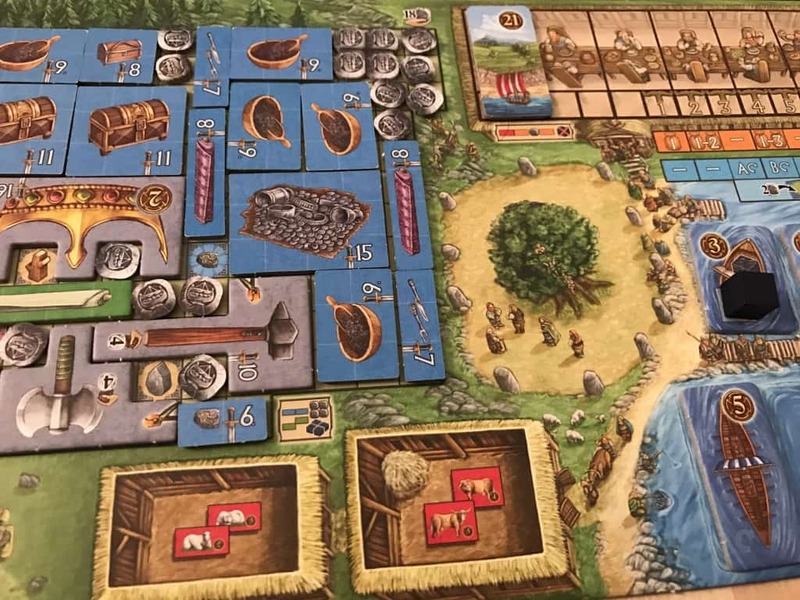 Somehow his largest box to date, A Feast for Odin is a clever blend of several familiar mechanics into a package that feels at once familiar and yet wholly unique in the annals of worker placement games. Released at Essen, A Feast for Odin reached gamers’ tables around the world about the same time thanks to a simultaneous worldwide release. So it’s been a joy to unpack and explore this sandbox euro with dozens of other games locally and thousands more online. 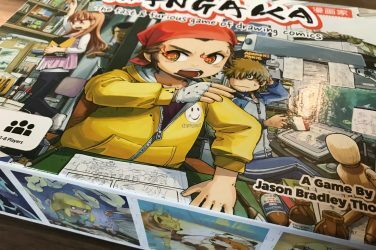 Let’s dig into what we’ve found, how the game ultimately plays, and whether it’s a good fit for your collection. A Feast for Odin is Rosenberg’s foray into the world of Viking management – a theme that has been surprisingly popular in recent years, with nearly a dozen quality euros hitting the market (not to mention the ameritrash brawlers with Viking themes). No one has gone into as much depth as Uwe though, digging into the intricacies of Viking life – from the hunt to whaling and exploration and emigration to nearby islands. 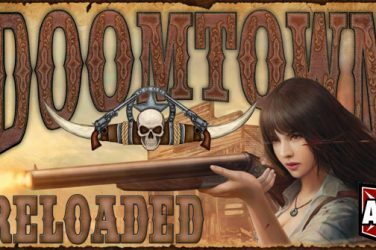 This is a game with 30 different resource types, nearly 70 different worker placement spots, four islands to explore, and half a dozen mechanics that work together seamlessly to create an experience that is guaranteed to be different every time you play the game. I’m not going to go through a full walkthrough of the game here – it’s a lot more beneficial to watch a video for a game this size – but let’s hit on some of the basics. Some actions are only taken in certain rounds, including the Harvest – which provides free orange goods (vegetables and fruit) – rotation of the exploration tiles, and bonuses which only occur when you’ve unlocked them. The majority of the game occurs during the worker placement phase. During this phase, player take turns placing 1-4 of their Vikings on the board. The board is divided into four columns – each requiring one more Viking to activate any given spot. So you can spend 1 Viking to get 2 fish for 1 silver, or you could spend 4 Vikings to get a boatload of resources and coins, plus play a card from your hand. 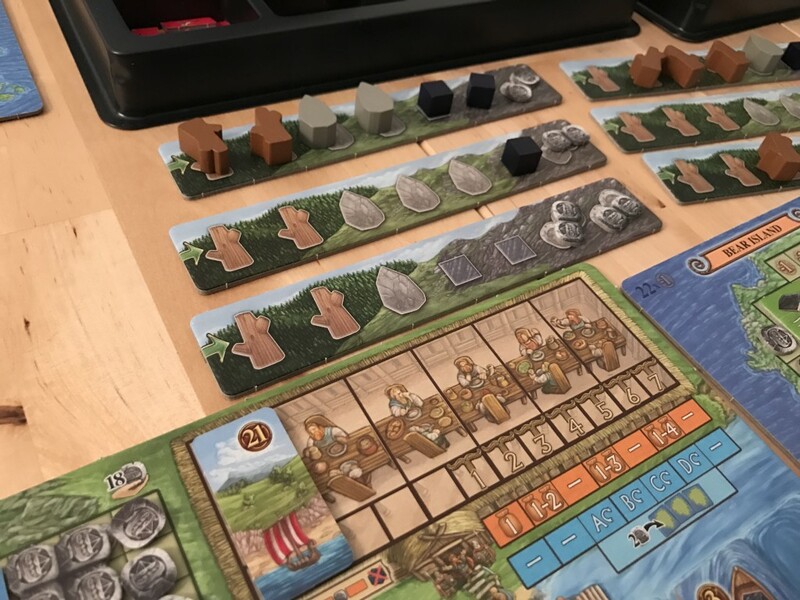 These worker placement spaces are broken down into rows as well, with the topmost rows representing things you can build (sheds, houses, and different types of boats), followed by hunting and whaling, resource acquisition, resource gathering from mountain tiles, trading, and exploration and pillaging. Each of the more advanced actions requires some form of other tile. To go whaling, for example, you need to have a whaling ship (and you can have up to three to make it easier). To get a whaling ship, you need wood. To get wood you need to explore a mountain tile. 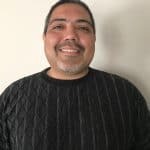 So for the more advanced actions, you’ll need to spend several actions building up to it, which in turn makes it so you really need to focus your efforts in one or two areas. Trying to do everything in this game will lead to a thinned out strategy in which you don’t get enough resources to complete your real objective. And that’s where the game really shines. The objective here, beyond getting the most points, is to ensure you don’t lose points. Your home board has income markers in a diagonal line up to the top right corner. To increase income, you must cover the tiles below and to the left of those icons. But at the top right you’ll find dozens of negative points that also need to be covered. So you need to balance income generation early with removing those negative points later. The tiles you trade for, pillage, or buy are going to be used to cover those spaces. This game is what birthed Patchwork as Uwe was developing it, so you can get an idea of what to expect in terms of carefully placing tiles in intricate patterns to cover your board and reduce point-loss. I’m only scratching the surface of the game here. There are powerful occupation cards that offer ongoing powers, one time actions, and victory points. There are hunting and pillaging actions that have you rolling dice (yes dice!). There are exploration actions that allow you to add new boards with new income and bonus opportunities. There is even a feed your people mechanic that works seamlessly and offers several benefits if worked properly. I strongly encourage you to go watch a play through video of this one if you haven’t yet. Let me just start by saying there won’t be a negatives section for this game. Nearly 10 plays in and I don’t have any negatives yet. It’s that good. 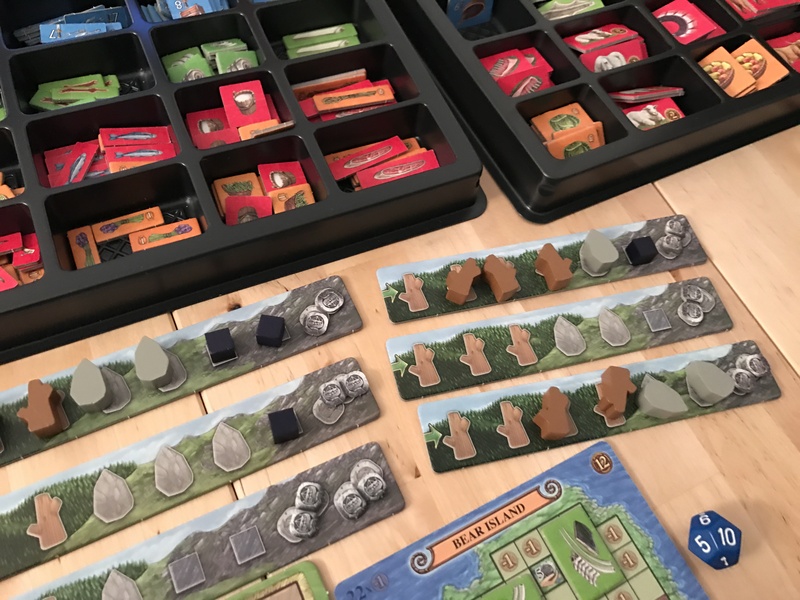 I’ve played all of Uwe’s games several times and loved most of them (Caverna, Fields of Arle, Le Havre, At the Gates of Loyang) and disliked a handful (Agricola…sorry). 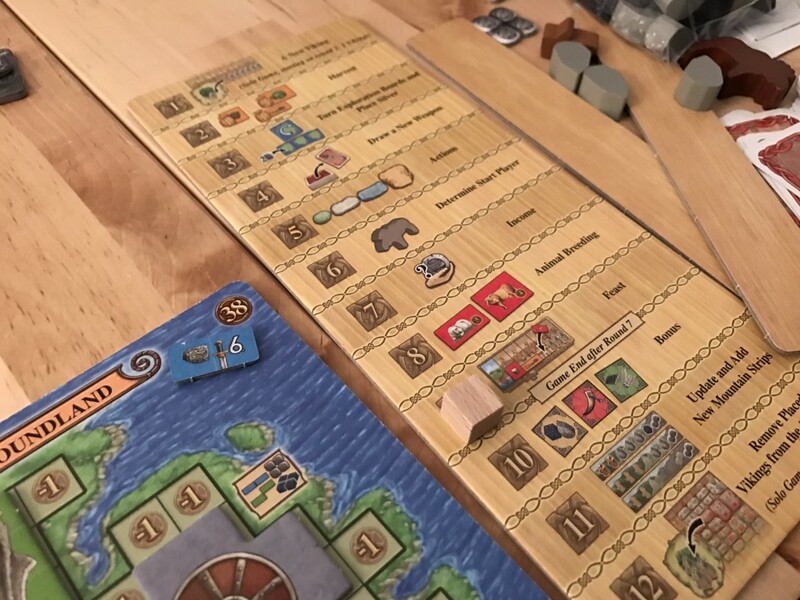 A Feast for Odin feels like a culmination of everything that has come before into one brilliant, perfectly cohesive board game that plays smoothly, relatively quickly, and with almost infinite replayability. 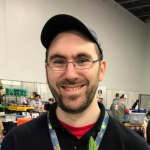 He manages to take the sandbox nature of Fields of Arle, the variability of action space options of Caverna, and the randomization and card components of Agricola and blend them into a game that ultimately boils down to spatial management of your resources. Everything you do is in service of covering those spaces on your board, generating greater income, and emigrating your people (among other things) to gain points. 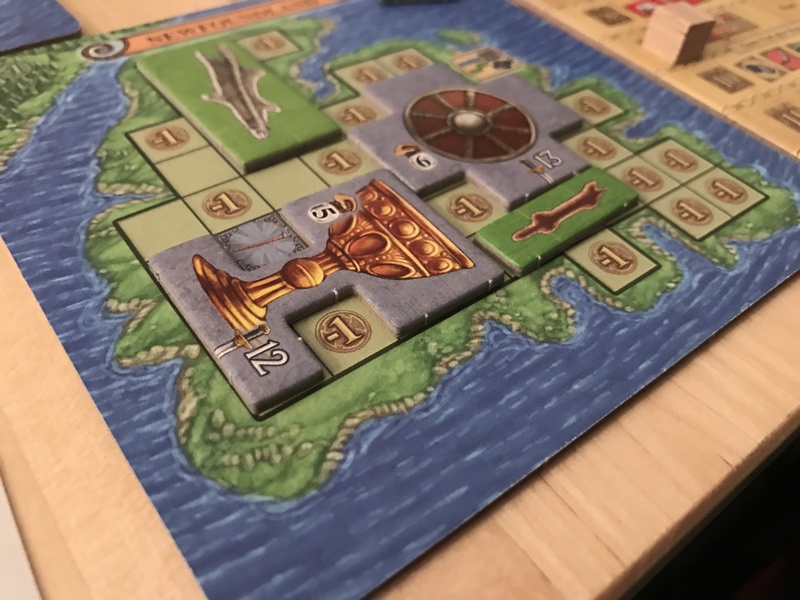 A well-played game of A Feast for Odin feels like an accomplishment, and yet you cannot take what you did in one game and replicate it in the next. The cards will be different. The die rolls will come up different. Other players will go to spaces you need. That carefully implemented bit of variability combined with the frequently limiting nature of any worker placement game make it so you need to be flexible at all times. Your overarching strategy cannot require a set number of actions or it will not work. And yet you will never feel locked out of possibilities. There is always a path forward. What is most interesting about this game and what has captivated many of the people I’ve played it with is the length. Rosenberg’s games have a reputation for running long. Even Fields of Arle which only plays with two can take upwards of 3 hours. Caverna with a table of four is a 3-4-hour game. Agricola can be equally long in some cases. A Feast for Odin is about 2 hours, plus any teaching time with four players. 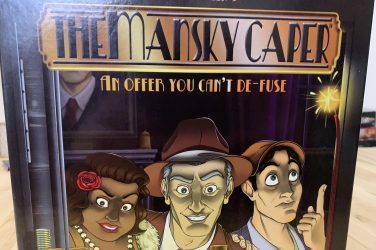 For what you pull out of that box and what goes on the table, that is phenomenal and shows the brilliance of reductive game design from a master like Uwe Rosenberg. 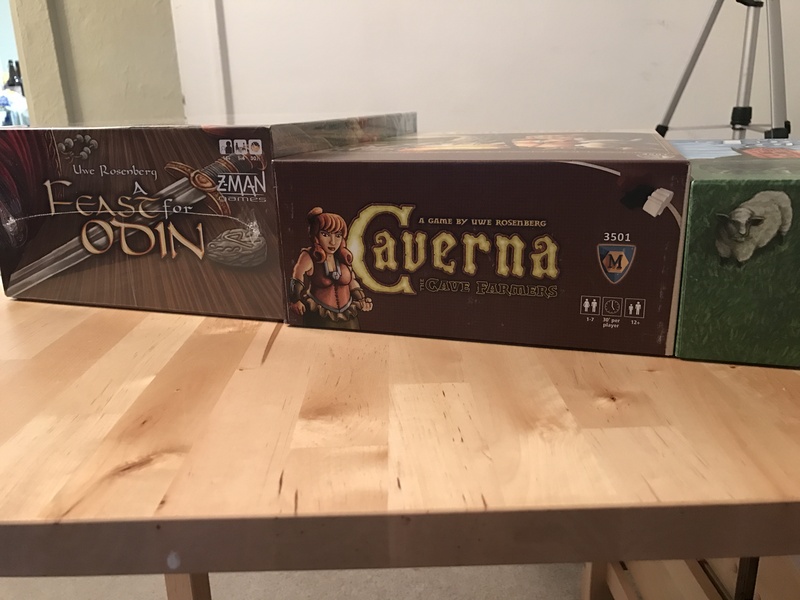 If you have enjoyed any of Rosenberg’s previous big box euros, you will like A Feast for Odin. You’ll probably love it. The number of options here, the ease of play, the speed at which players pick up the new concepts and play style, and the sheer volume of cool stuff to look at and learn about (there is a lengthy appendix too if you want to know what a “Thing Square” is), makes A Feast for Odin quite arguably Rosenberg’s masterpiece (and already a game that has spawned a whole new line of releases in Patchwork and Cottage Garden with the tile laying components). This game is an absolute buy and a perfect 10 rating from me. 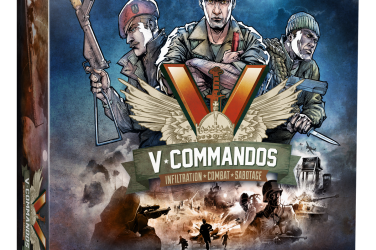 If you have a chance, get this game. Yes, it’s expensive, but it’s worth every penny of it. 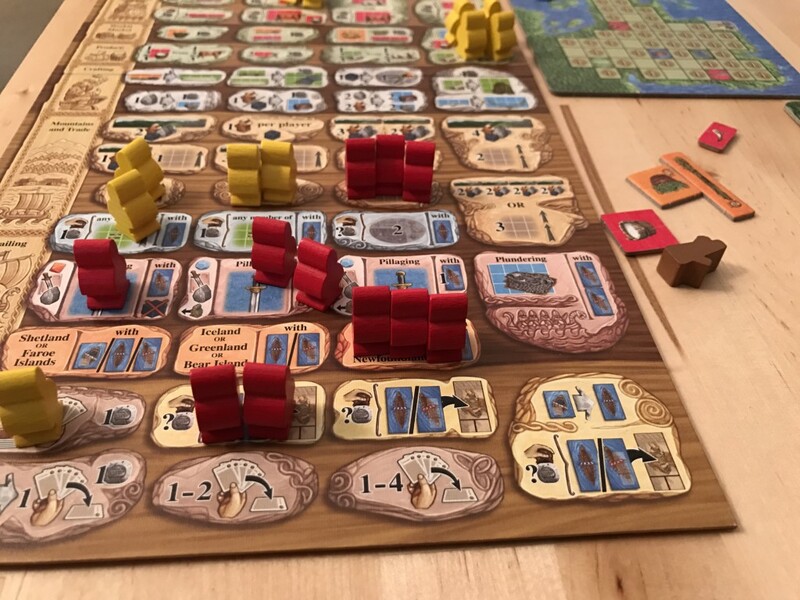 A Feast for Odin is one of the best euros of the year and a perfect 10 out of 10 for Rosenberg, somehow managing to surpass all of his other recent releases and create a brilliant experience. 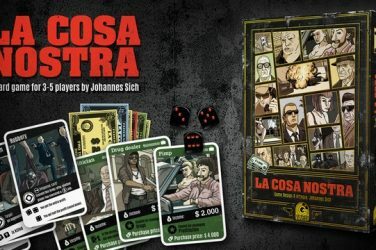 I’m surprised nobody mentions the fact that it’s a nightmare to teach this game and that the theme despite being based on accurate historical information is actually pretty thin when you’re playing the game. I feed more people by placing my bread in a horizontal line………………..WHAT?!?! 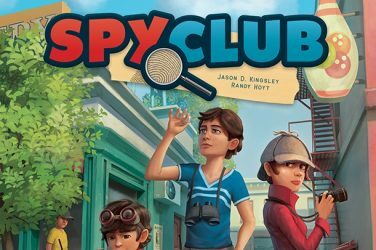 This is the game that made me realize just how much I dig into the mechanics over theme (with Jason’s help pointing it out of course). This is the puzzliest of puzzle euros, and some of the mechanisms are humorously abstract, but man do I have fun with it. I’ve had good and bad situations teaching. People who have played Rosenbergs before seem to latch right on because it’s just more of the same (TIMES 10! ), and others get dragged down by the action board. I definitely get that – though breaking it into the six action categories certainly helps. I don’t think I’ve had a game of this go past 3 hours (which admittedly does not include teaching which can tack on 30+ with a bunch of new players). How long are your plays? I know we had hugely different experiences with Terraforming Mars play times (though, I have now experienced the dreaded 4.5 hour game of that…shudder…). Final Round – Tabletop Madness Vote!